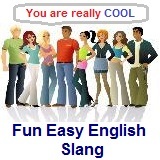 ﻿ Fun Easy English - new american english slang letter l.
In this lesson you will learn American English slang beginning with the letter L. You will learn the definition and study the usage of each slang. lame an inadequate That is really a lame excuse. later See you later We can eat dinner together tonight. Later. line story I have heard that line a million times. lip disrespectful talk The students are usually giving the teacher lip. loser annoying and useless John is a loser. love handles fat around my waist I exercise every day, but I can't get rid of these love handles. Hey do you know any English slang beginning with the letter L not listed on this page?